Have you thought about adding a Custom or Aftermarket Body to Make your golf cart Stand out in the Crowd? The Club Car Precedent Electric and Gas Golf Carts both have plenty of aftermarket accessories available to completely personalize your golf cart to match your own tastes and uses for the golf cart. For some, a golf cart is a practical and inexpensive way to get around their property or campground areas. For others, a golf cart is so much more. Your golf cart can be a really fun way to get creative with customization that make the cart you drive very specific to your wants and needs. 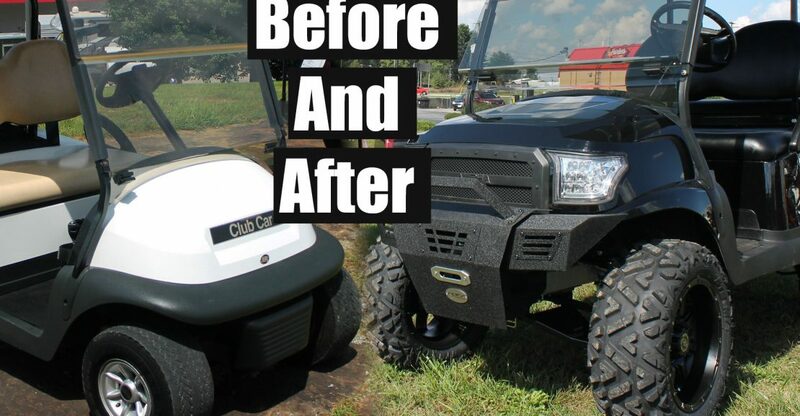 To take a stock golf cart and give it a really major overhaul in visual and performance upgrades is still far less expensive than buying a comparable side x side or other piece of similar equipment. We have done many Club car Precedent golf carts in various styles and set ups and rarely do we exceed $6000, far less than many four wheeler’s or gator/mule type vehicles. With that in mind, adding a custom aftermarket body like the Alpha Style Body that we added to this 2007 Club Car Precedent may be one of the bigger investments you may make in your golf cart, but well worth the time and money. Adding a custom body is easy if the kit is made well. An Alpha body by MadJax is an affordable option for getting a custom look! Quick Tip: It helps to have an extra set of hand to put the Alpha Body Kit onto the Club Car Precedent. The Alpha Body is an aftermarket body made by MadJax. It is available in multiple colors; Blue, Red, Black and White. There are several benefits to using a body kit like the Alpha Body kit from MadJax. Being from a large brand like MadJax, there are many other add on accessories that are made to fit the new styling of the front cowl. Many kits that you would add from other companies would eliminate your ability to use accessories such as the standard Club Car Precedent Brush Guard or other bumper mounted items. Madjax has a growing line of items that are designed to match up perfectly with the Alpha Body front cowl. They have Brush Guards, Grills, Hood scoops, and the heavy duty Armour Bumper with space to mount a winch and Led Light Bar and Spot Lights. The Alpha Body comes with step by step instructions. The instructions are well thought out and most people can probably work through the install in a few hours. There are a few little tweaks that we have made to the way we install the body that are more efficient than the factory instructions, but I would say for the beginner installer the best thing to do would be to stick to the steps. Subscribe to our Youtube Channel for future Videos. In future videos we will try to actually record the step by step process of installing an Alpha Body for the Club Car Precedent Golf Cart.